Are you ready to learn about the Electrophysiology of the Heart? I sure hope so because that is what we are going to discuss in this study guide. As a Respiratory Therapy student, as you will soon learn, you must know and understand not only the lungs, but the heart as well. And it all started with the electrophysiology of the heart and how that affects the rest of the body. Below, you will find several helpful practice questions that can help you learn everything you need to know about this subject. The best part is, if you put in the extra work to learn this information now, it will help you for years to come. So let’s go ahead and dive right in! 1. Where is the sinoatrial (SA) node? It is at the right atria next to superior vena cava entrance. 2. Where is the atrioventricular (AV) node? It is at the floor of the right atria between the atria and ventricle. 3. Where is the Bundle of His? It is at the interventricular septum. 4. Where are the Purkinje fibers? They are innervating throughout the ventricles from the apex towards atrioventricular valves. 5. What is the function of the SA node? It is the master pacemaker. 6. What is the function of the AV node? To relay SA node impulse to ventricles. 7. What is the function of the Bundle of His? It propagates electrical impulses to ventricular apex. 8. What is the function of the Purkinje fibers? It propagates cardiac action potential throughout ventricles. 9. What are the components of the cardiac electrical conduction system? Sinoatrial node, Atrioventricular node, Bundles of His, and Purkinje fibers. 10. How are the components of the cardiac electrical conduction system connected? They are all electrically coupled so the fastest working impulse rate wins. 11. What happens if the SA node is damaged? Other things can use their pacemaker activity to kick in (even though it’s slower). 12. What are the 3 conduction pathways between the SAN and AVN? Posterior tract, middle tract (faster than posterior), and anterior tract. 13. What is interesting about the anterior tract between the SAN and AVN? It bifurcates to Bachmann’s bundle. 14. What is the function of Bachmann’s bundle? It carries SAN impulse to the left atrium. 15. Is conduction velocity of electrical impulses in the heart equal? 16. What is the slowest stop in the heart? From the AV node to Bundle of His. 17. What does sympathetic arousal do to heart? PKA increases and HCN4 stimulated. 18. What does parasympathetic arousal do to heart? cAMP decreases, PKA decreases, and HCN4 inhibited. 19. What is the point of a refractory period? It keeps action potential from going backwards. 20. What factor affects the width of the QRS complex? It depends on the velocity of depolarization of the ventricle. 21. In pacemaker cells of the SA node, the action potential is due to the opening of what channels? The opening of long-lasting (L) Ca2+ channels. 22. Pacemaker potential in pacemaker cells of the SA node is due to? Decreasing outflow of potassium ions and the opening of transient (T) Ca2+ channels. 23. What cardiac sound does the QRS interval contain? 24. What ECG segments represents the conduction of an action potential through AV-node and AV-bundle? P-Q segment and P-R segment. 25. What wave represents atrial repolarization? Beginning of Q wave to the peak of R wave. 26. What ECG segment represents the completely depolarized ventricles? 27. What effect on the ventricles can be seen on an ECG? One or more P waves may occur without initiating a QRS complex. The atria can depolarize regularly, while the ventricles contract at much slower pace. 28. How do you look for heart rate on an ECG? Beginning of one P wave to the beginning of the next P wave or from peak of one R wave, to the peak of the next R wave. 29. Tachycardia can be seen on ECG as? A closer distance between two P waves or between two T waves. 30. Bradycardia can be seen on ECG as? A further distance between two P waves or between two T waves. 31. What is the area that connects cardiac cells? 32. What is the area between cardiac cells where permeability is the greatest which allows the electrical signal to pass quickly between the cells? 33. What allows an electrical current to easily flow into individual cardiac cells? 34. What substance enters the cell when it is electrically activated? 35. What is the resting membrane potential value? 36. What accounts for the resting membrane potential being a negative value? The cell is highly permeable to potassium, so it leaves the cell to enter a lower concentration gradient. 37. What can result from having a lower than normal concentration gradient? 38. Do the SA/AV node have higher or lower threshold potentials than the rest of the cardiac cells? Lower (-30 to -40 mV vs -60 to -70 mV). 39. What is happening during stage 0 of the cardiac cell action potential? Depolarization, the fast-acting sodium channels are open. 40. What is happening during stage 1 of the cardiac cell action potential? Initial repolarization, the fast-acting potassium channels are open and sodium channels are closed. 41. What is happening during stage 2 of the cardiac cell action potential? A leveling off at 0 charge, slow acting calcium channels are open and potassium channels are still open. 42. What is happening during stage 3 of the cardiac cell action potential? Late repolarization, calcium channels close but sodium channels still open. 43. What is happening during stage 4 of the cardiac cell action potential? Resting state, all channels are closed, only the sodium/potassium pump is working. 44. What is happening during the p wave of the ECG complex? Depolarization of the atria beginning with SA node. 45. What is happening during the QRS complex of the ECG complex? Ventricular depolarization which it also covers up atrial repolarization. 46. What is happening during the T wave of the ECG complex? 47. What is happening during the U wave of the ECG complex? 48. What is happening during the P-R segment of the ECG complex? The ventricles are filling with blood from the atria. 49. What happens at the J-point of the ECG complex? 50. What happens during the S-T segment of the ECG complex? The time between the end of ventricular depolarization and start of repolarization. 51. What is needed for the heart pump to meet the needs of the body? adequate filling must occur during diastole. 52. What triggers an action potential? Depolarization of the plasma membrane and a shift in the membrane potential to a less negative value. 53. What is the threshold potential? It is the critical level to which a membrane potential must be depolarized to initiate an action potential. 54. During an action potential, which ions temporarily dominate? 55. What are the pacemakers of the heart? SA node, AV node, and Purkinje fibers. 56. What is a pacemaker? It is the spontaneous time-dependent depolarization of the cell membrane that leads to an action potential. 57. What is the sinoatrial node? It is in the right atrium. Fastest pacemaker and primary site of origin of electrical signal which sets the heart rate in normal conditions. 58. What is the atrioventricular node? It is located just above the atrioventricular ring. It does not set the heart rate in normal conditions and only when SA node fails. 59. What are Purkinje fibers? They originate in the AV node. They conduct an electrical signal from atria to right and left ventricles. Tertiary pacemakers – only become the primary pacemaker in case SA and AV nodes fail. 60. What is the normal source of the initiation in an electrical cycle? 61. What causes the depolarization and repolarization of the heart? Once an electrical cell generates an electrical impulse, this electrical impulse causes the ions to cross the cell membrane and causes the action potential, also called depolarization. Repolarization is the return of the ions to their previous resting state, which corresponds with the relaxation of the myocardial muscle. 62. What are the normal values of the electrolytes inside the cardiac cell? Sodium (Na) = 5mEq/L, Potassium (K) = 145 mEq/L, and Calcium (Ca) = 1 mEq/L. 63. What are the normal values of the electrolytes outside the cardiac cell? Sodium (Na) = 145 mEq/L, Potassium (K) = 5 mEq/L, and Calcium (Ca) = 4 mEq/L. 64. What part is the origination of a nodal rhythm? 65. What are some of the causes of a nodal rhythm? Hypoxemia, caffeine, nicotine, electrolyte imbalance, and some drugs. 66. What is cardiac reserve? The difference between resting cardiac output and maximum cardiac output. 67. What happens during a myocardial infarction? Myocardium death due to ischemia. 68. How do we treat a myocardial infarction? Angioplasty, coronary bypass surgery, and stent. 69. What is CHF and its causes? Congestive Heart Failure (CHF) occurs when one ventricle is not as efficient as the other ventricle. 70. What is pulmonary edema? It is the fluid accumulation in the tissue and air spaces of the lungs, leading to impaired gas exchange and respiratory failure. 71. What is systemic edema? An abnormal accumulation of fluid in the interstitium, located beneath the skin and in the cavities of the body which can cause severe pain. Clinically, edema manifests as swelling. 72. What are the characteristics of a primary cardiac cell? Automaticity, excitability, conductivity, and contractility. 73. What is a Sinus Rhythm? 74. What is the Lubb sound? The closing of AV valves during ventricular diastole. 75. What is the Dubb sound? The closing of Semilunar Valves during ventricular systole. The Contraction that Increases pressure and decreases volume. It is relaxation that decreases pressure and increases volume. 78. What is the cardiac cycle? It is one complete contraction and relaxation of the heart. 79. What is an arrhythmia? 80. What are the two refractory periods? (1) Absolute – the time in which the cells cannot respond to a stimulus. Phases 0, 1, 2, and half of 3 represent the absolute refractory period. (2) Relative – the time in which repolarization is almost complete and a strong stimulus may cause depolarization. The second half of phase 3 represents the relative refractory period. So there you have it. 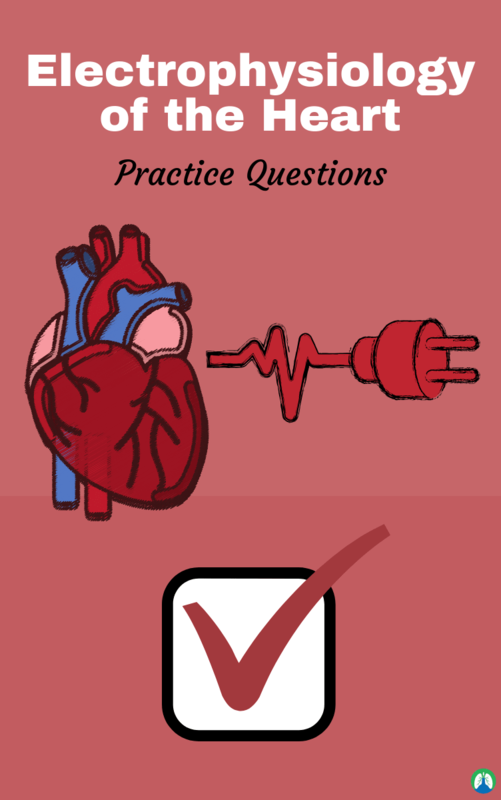 You can use this study guide to learn everything you need to know about the electrophysiology of the heart. As a Respiratory Therapy student, this is a topic that you will need to be all too familiar with. So you might as well learn go ahead and learn this information now by going through these practice questions again and again until the information sticks. Thank you so much for reading and as always, breathe easy my friend.